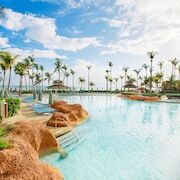 This activity-packed resort stands along the white sands of Cable Beach, across from the Cable Beach Golf Club; Ardastra Gardens, home to parrots and “parading” flamingoes, is 2 miles away. 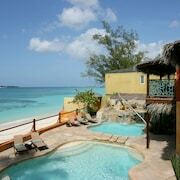 Located in the heart of Nassau, this inn is within a 15-minute walk of Saunders Beach, Junkanoo Beach, and Nassau Botanical Gardens. Straw Market and Queen's Staircase are also within 3 mi (5 km). 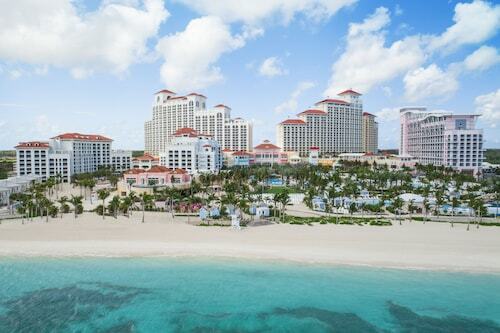 This all-inclusive resort is located on the white sands along the Atlantic, offering the relaxation of water views and proximity to the nightlife of the Bahamian capital. 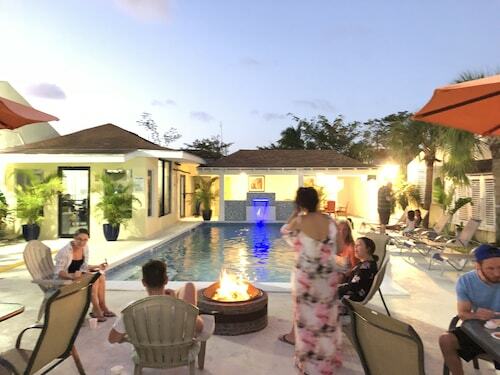 Located in Paradise Island, this beachfront resort is next to a golf course and within 1 mi (2 km) of Versailles Gardens, Cabbage Beach, and Paradise Island Golf Club. Ocean Club Golf Course and Straw Market are also within 3 mi (5 km). 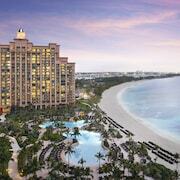 How Much is a Hotel Room in Nassau? 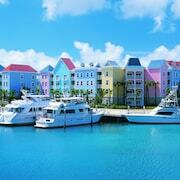 Hotels in Nassau start at $275 per night. Prices and availability subject to change. Additional terms may apply. 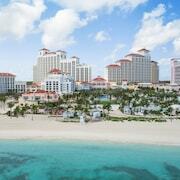 Author Frank Sonnenberg once said, "Paradise is not a place, it's a state of mind." 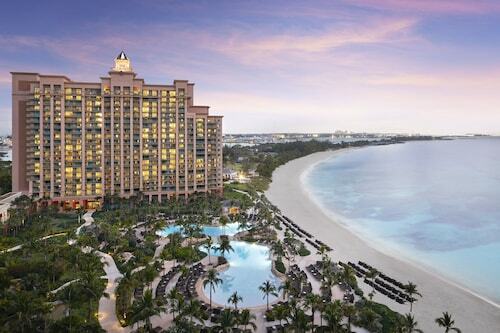 And while Nassau, the largest city in the Bahamas, offers visitors a pristine paradise, the quality of your time spent here will be measured by your willingness to embrace serenity and joy during your days at any of the hotels in Nassau. With sparkling white sand and vivid turquoise waters, you can relish in the vibrant colors of the Caribbean, while an orchestra of ocean waves provides a soundtrack for your newfound outlook on life. Pools and hot tub: Take a dip in any of the three outdoor pools featuring plunging waterfalls that face the sea, or enjoy a hydro massage in the high-end hot tub near the hotel’s gardens. Dining and drinks: Feeling hungry? Swing by any of the six specialty restaurants and lounges on the property, including Aqua, The Market Place, EstaVida, O’ Grille, and Wet Bar. Entertainment and child care: The resort’s calendar is chock full of activities and shows keep you entertained, while a Kids’ Club keeps the young ones occupied. 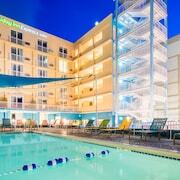 Fitness center: Stay on top of your daily workout with the hotel’s convenient free 24-hour gym. Wedding space: In the mood for love? Host your wedding at this hotel’s garden gazebo, and celebrate your special day with superior service in an ideal location. 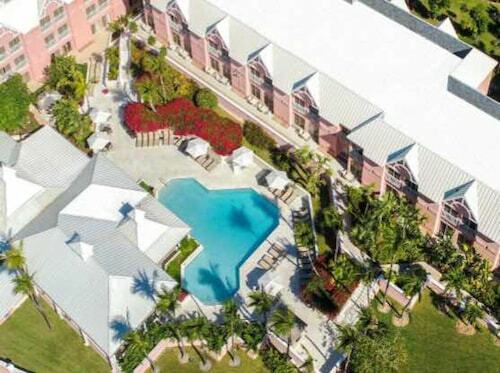 Breezes Resort Bahamas All Inclusive for all-you-can everything: Situated on a sublime stretch of Cable Beach’s white sand, Breezes Resort keeps things simple by offering all of their services and amenities for one fixed fee. Better yet, tipping is absolutely forbidden, meaning you’ll know exactly what your wallet’s in for. So what services are there, you ask? Dining: Feast on meals in any of the resort’s myriad restaurants, including Italian, Asian, and a la carte options. Drinks: Wet your whistle whenever you’d like, thanks to the resort’s all-you-can-drink bar service offering premium wines, liquors, beers, plus nonalcoholic options as well. Entertainment and outdoor activities: From tennis to sailing and rock climbing to pool volleyball, there’s no end to the activities offered here. 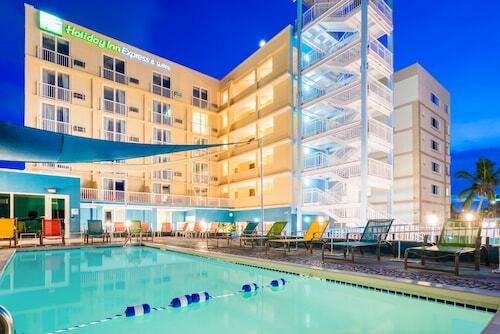 Toss in live nightly entertainment, and you’ll never be without something to do. Dining and drinks: With two restaurants and two bars on-site, you won’t have to go far to grab some food or a drink at any time of day. The Aqua restaurant is especially famous for its international plates featuring a Caribbean flair, while the posh Bullion Bar is beloved for its impressive selection of rums and other liquors. Event space: Offering more than 13,500 sq. ft. of versatile event space, the hotel is the ideal venue for weddings and corporate events of any size. 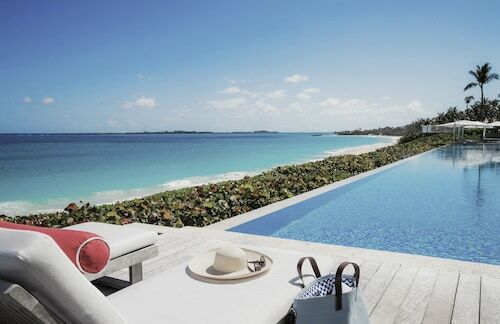 Pool and cabanas: Looking to cool off? Spend some time in the outdoor freshwater pool, then relax in cabanas before undertaking any of the popular aquatic activities. Dining and drinks: Fill your belly at Stew Fish seafood house, serving up fresh catches paired with chilled chardonnay, often beside a bonfire set to a soundtrack by a live Junkanooband. 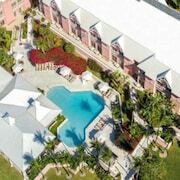 Spa services: Pamper yourself at Red Lane Spa, which offers classic European treatments with a Bahamian twist. Whether you’re enjoying a heart rock massage on a sea raft or a salt scrub on the beach, all services take place on a secluded stretch of sand. 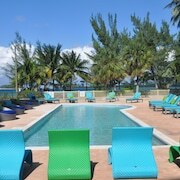 Pool: For a more exclusive atmosphere, drop by the Offshore Island Beach Club. 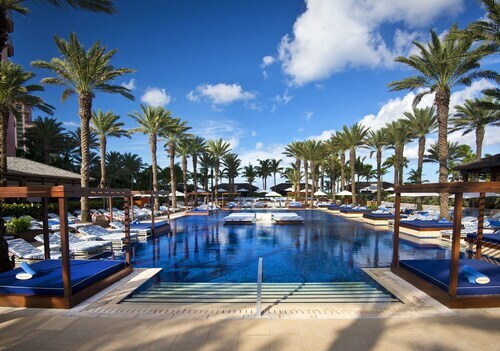 With a lagoon-style pool, lounge chairs built for two, and a swim-up bar, the Beach Club grants you access to the resorts best amenities. 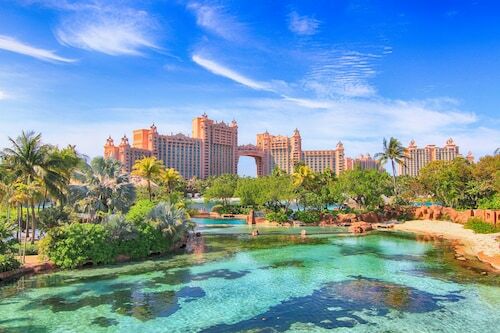 If you can’t wait another minute to begin your adventure in the Bahamas, count on Travelocity to help you book cheap hotels near Nassau at any time of year. 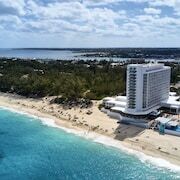 Our selection of Nassau lodging options is more extensive than anywhere else online, ensuring that you’ll have the greatest number of places to choose from. 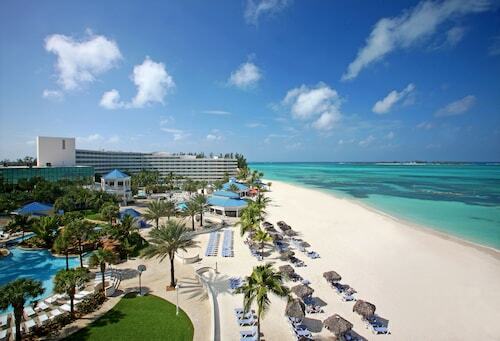 Book your stay at one of the Nassau hotels today, and you be on the beach before you know it. Everything at this property is just exactly what it was advertised. They are friendly, polite, helpful and our stay was as wonderful as it could have been. We plan to go again some time soon. Thank you !! 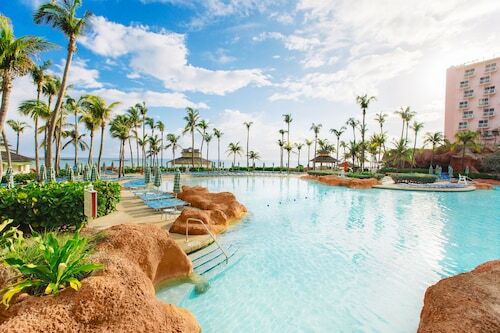 Pool area is very small but the beach is right across the street. Everything from the second we arrived was absolutely A++++!!!!! We even stayed two extra days because it was so amazing!! The only thing is the food is very expensive but it was DELICIOUS!!!! Can’t wait to go back!!!! 2 days ago by A verified traveler from Port of Spain, Trinidad and Tobago.